Check out these Aladdin's Castle Pinball Machines For Sale from Bally 1976. You will also find parts and accessories for current owners including the rubber ring kits, decals, ramps, manuals, translites, flyers, and sling shots. Get ready to ride your magic carpet with... ALADDIN'S CASTLE! For the initiated, Bally pinball machines need no introduction. 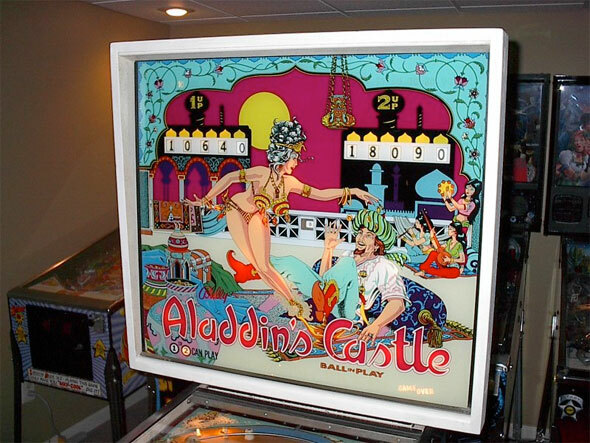 Aladdin's Castle was one of the last great two player mechanical pinball machines to ever roll of the Bally assembly line. Shortly after this, in 1976 Bally switched over to making digital electronic solid state pinball machines, forever changing the sights sounds and style of gameplay that we all grew up with. This game takes you to the fantasy world of magic flying carpets, snake charmers and belly dancers. The artwork is classic 70's Bally with outrageously curvy women and a bright and beautiful color palette. Vintage pinball machines are presently enjoying a renaissance period with young and old alike finding new enjoyment in these games of the past. This classic machine has genuine mechanical Bally style play with fast ball movement and LOADS of playfield action.